(Temecula, California) November 29, 2018 – The Anti-Counterfeiting Task Force (ACTF) accomplished major victories combatting fakes and educating the public about counterfeits in the marketplace in 2018, according to ACTF Coordinator Beth Deisher. She envisions continued success in 2019 following the recent major reorganization of the group’s parent organization, the Anti-Counterfeiting Educational Foundation (ACEF). The nonprofit Foundation originally was operated by the Industry Council for Tangible Assets (ICTA) but recently left ICTA. As of November 20, 2018, the Foundation’s Board of Directors now is composed of volunteer members of the Professional Numismatists Guild (www.PNGdealers.org) Board who will handle the administrative duties and assist with fund-raising needed to support ACTF’s efforts to fight fakes. “The Foundation continues as a 501(c)(3) corporation and is separate from PNG. All donations to ACEF are tax deductible,” emphasized the Foundation’s and PNG’s Executive Director Robert Brueggeman whose background is in law enforcement and security. “PNG will continue to provide $10,000 a year to the Foundation and individual PNG members also are making donations, such as Wayde Milas and Brett Charville who each pledged $10,000 a year for five years. The Foundation and its Anti-Counterfeiting Task Force operate solely on donations, and there is a large need for additional funds of any amount from individuals as well as hobby and trade organizations so this crucial work can continue,” Brueggeman emphasized. “We also want to expand the task force’s network of experts who can assist law enforcement agencies in identifying counterfeits. Another planned effort in the coming year is seeking changes in local, state and federal laws and regulations to give higher priority and faster adjudication for counterfeiting crimes,” said Deisher. Deisher will serve as Director of Anti-Counterfeiting for the Foundation and Coordinator for its Anti-Counterfeiting Task Force. Provided assistance in more than 30 active cases of counterfeit coins and precious metal bullion products being investigated by U.S. Customs and Border Protection, U.S. Homeland Security Investigations, U.S. Secret Service, and U.S. Treasury Department’s Office of Inspector General. Expanded the Anti-Counterfeiting Task Force’s Expert Network and providing experts to assist law enforcement in identification of counterfeit coins and bars. The largest case prosecuted during 2018 involved seizure of thousands of counterfeits. If the fakes in this single case had been genuine they would have had a retail market value of more than $48 million. 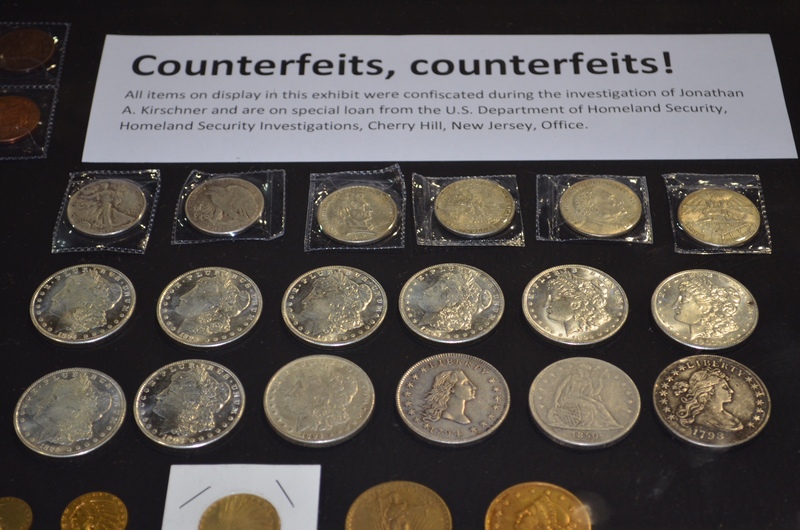 Sponsored and mounted an unprecedented five-case, public education exhibit of counterfeit coins and bars during the American Numismatic Association’s World’s Fair of Money® in Philadelphia. The counterfeit items were made available through special arrangement with the U.S. Department of Homeland Security Investigations. Developed and conducted the first survey to determine prevalence of counterfeit coins and precious metals bars in the U.S. marketplace. Worked with supervisors of Customs and Border Protection’s (CBP) regional centers to determine the best methods of providing educational materials and training CBP agents to create awareness of counterfeit coins and precious metals bars illegally entering the United States. For additional information and to make a donation, contact the Anti-Counterfeiting Educational Foundation at 28441 Rancho California Road, Suite 106, Temecula, CA 92590. The phone number is 951-587-8300. Or contact ACTF Coordinator Beth Deisher at 567-202-1795.